There are many environmental pressures that influence declines in migratory bird populations through impacts on behavior and habitat utilization. However, there is a dearth of research on how these processes act during the non-breeding season in most species, particularly Neotropical migrants. This period is of great importance however, considering in comprises the majority of the annual cycle, and it is when birds face the most extreme environmental conditions (e.g. tropical dry seasons). 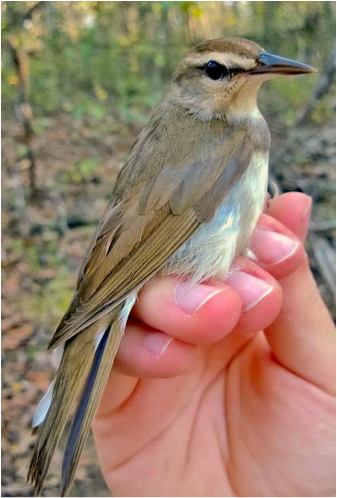 We are addressing this issue in a declining species of concern that breeds in North America, the Swainson's Warbler, during the non-breeding period in Jamaica. Alicia Brunner, a current graduate student in the Tonra lab, is conducting her M.S. thesis on how Swainson's Warblers utilize their habitat along a moisture gradient in dry tropical forest. The Caribbean is expected to experience significant drying due to climate change and Alicia is looking at how this could potentially affect these ground foraging warblers that specialize in dry habitats. She is interested in how litter layer and moisture affect arthropod and lizard prey availability and how this could influence home range size and local movement throughout the season.